Apple Pie is rated 5.0 out of 5 by 3. Rated 5 out of 5 by Brownie from Thanksgiving Finale I had this pie delivered to my daughter in SF for her Thanksgivingdinner. She wasn’t able to come to Detroit. It was a real treat. They loved it. Rated 5 out of 5 by Scojo from Delish! Just bought my 4th or maybe even 5th apple pie, sending them all to my in-laws. They LOVE it, and believe me my father-in-law is very picky about his apple pies. They've told me that each one is as good as the last. Blissfully sweet with a hint of spice! 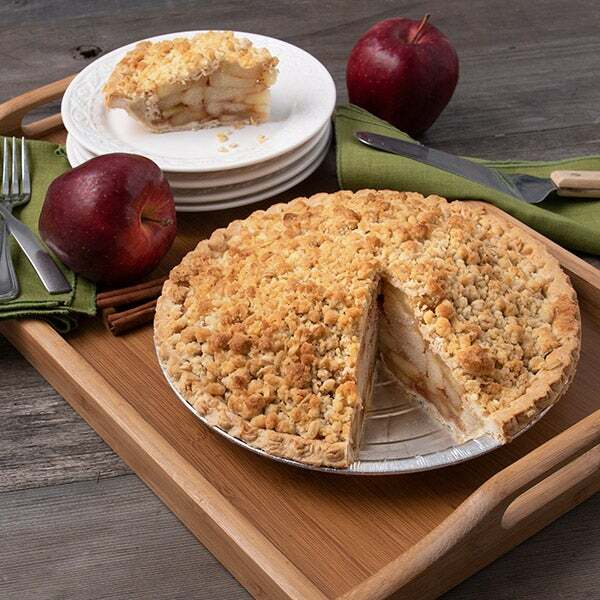 We fill our flaky, buttery crust with thick slices of orchard-picked apples that are coated in a combination of ground cinnamon, freshly grated nutmeg, and sugar. After being baked to gooey golden brown perfection, guests and recipients will find this iconic dessert completely irresistible.